Buveur D'Air was sensational in last year's Champion Hurdle, and the Nicky Henderson-trained raider will attempt to be the first horse since Hardy Eustace to retain the coveted Grade 1 crown on the opening day of the Cheltenham Festival, and the JP McManus-owned seven-year-old will be a red-hot favourite to retain the prize on March 13. We take an in-depth look at the 2018 Unibet Champion Hurdle, and pick out the key contenders for the Prestbury Park showpiece. Eight wins on the bounce have propelled BUVEUR D'AIR into the upper echelons of the National Hunt sphere, and while a brace of those victories came over fences, it has been the hurdling division that has seen the gelding blossom, and his four-and-a-half length victory over stablemate My Tent Or Yours in last season's Champion Hurdle just capped off a stunning campaign over timber, which also saw him land the Aintree Hurdle in April. A best-priced 8/11 shot with Betfair Sportsbook, Buveur D'Air has continued his dominance in the new campaign, and Henderson's charge kicked off the season with a facile three-and-a-half length win over Irving in the Fighting Fifth Hurdle, while he comfortably dispatched the veteran The New One in the Christmas Hurdle at Kempton Park on Boxing Day to cement his place at the head of the betting for the Champion Hurdle. A slick jumper, Buveur D'Air's only defeat over hurdles came at the 2016 Cheltenham Festival, as he finished third to a certain Altior in the Supreme Novices' Hurdle, and he is entitled to be a red-hot jolly for this year's Champion Hurdle. He has an exceptional cruising speed, and with the spring ground likely to see him at his best, then it's hard to see him not taking the opening day's feature at the four-day National Hunt extravaganza, and he can be the first horse since Hardy Eustace in 2005 to win back-to-back races. A total of 23 entries for the Unibet Champion Hurdle at the Cheltenham Festival. Irish trainer Willie Mullins has a sensational record in the Champion Hurdle, having saddled four of the last seven winners, but the master of Closutton may have six horses entered for the race, but a host of those performers may not even take their chance in the race, and there are question marks hanging over the sextet, as to whether they will feature. 2015 winner FAUGHEEN would spearhead the Mullins charge, if fully fit, but having had a lengthy time off the track, he was pulled up in the Ryanair Hurdle last month, and while he will hope to bounce back to form in the Irish Champion Hurdle in a couple of weeks, the current 5/1 with Coral is far too risky to get stuck into. At his best, Faugheen would outclass Buveur D'Air, and he had tasted victory in the Morgiana Hurdle before that Ryanair Hurdle flop, but while many will snap up the 11/4 with some firms, who are non runner no bet, the horse dubbed 'The Machine' certainly lacks that aura about him these days, and he is one to avoid. YORKHILL (10/1 with Coral), and MIN (20/1 with Ladbrokes) are another brace of Mullins' entries, but both will take their chance over fences, and will not line up, so it's former Supreme Novices' Hurdle runner-up MELON that is set to be the premier Mullins-trained option, and he is 7/1 with Ladbrokes. A winner of the WKD Hurdle at Down Royal, Melon was then beaten by My Tent Or Yours in the International Hurdle, so he will need to improve immeasurably to play his hand in the Champion Hurdle, and he lacks that turn of pace to win this elite contest, and will struggle. The 2018 Champion Hurdle could see a sparse field head to post, but there should be some decent British challengers lining up, and the aforementioned MY TENT OR YOURS could have his fourth crack at the race, and having finished second on his three previous attempts, then the 16/1 with Ladbrokes could be the each-way play in the race. He showed when winning the International Hurdle that he still packs a punch, and while he may not have the class of his stablemate Buveur D'air, he will relish the strong pace, and has to be the selection in the ante-post market, and the 11/2 for him in the betting without Buveur D'air is a cracking bet, as well. 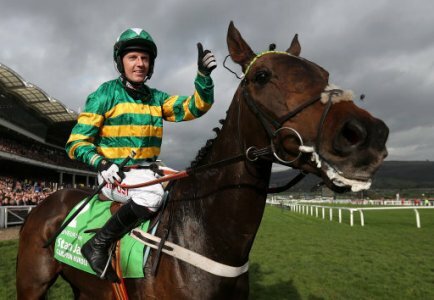 THE NEW ONE is another Champion Hurdle regular, but while he won the Champion Hurdle Trial at Haydock Park, the 25/1 shot with Ladbrokes, is set to take his chance in the Stayers' Hurdle, and it could be DEFI DU SEUIL that is another premier British challenger alongside My Tent Or Yours. A fine winner of the Triumph Hurdle last year, he put up a disappointing effort when tailed off in the Coral Hurdle at Ascot, but he is certainly one that will improve for the quicker ground in March, and at 20/1 with Ladbrokes is another that should take his chance, and adds more depth to the JP McManus team. A field as low as six runners could line up, with so many clouds hanging over a number of participants, but Ryanair Hurdle winner MICK JAZZ could be an Irish challenger, as despite having his job made easier by the flop of Faugheen, he is an improver over timber, and at 33/1 is another each-way option, while Emerald Isle charge APPLE'S JADE (25/1) is entered, but is set to take her chance in the Mares' Hurdle, a race she won last year. CALL ME LORD was a smart handicap hurdle winner last time out, and is 40/1 with Betfred, and if he can shine in the Betfair Hurdle at Newbury next month, then could be a springer in the Champion Hurdle market, while CHARLI PARCS (66/1) is another towards the bottom of the betting, but was only sixth in the Triumph Hurdle last year, and is certainly not of the class to figure in this sort of contest.